In a bowl mix dressing, pepper, salt, basil, and parsley; pour into the pot of a slow cooker. Place chicken into sauce mixture, and then flip chicken over so that both sides are saucy. Cover and cook on high for 5-6 hours, or low for 7-8 hours. Remove chicken from slow cooker and shred using 2 forks. There will be some sauce left in the slow cooker, reserve in a bowl and set aside. 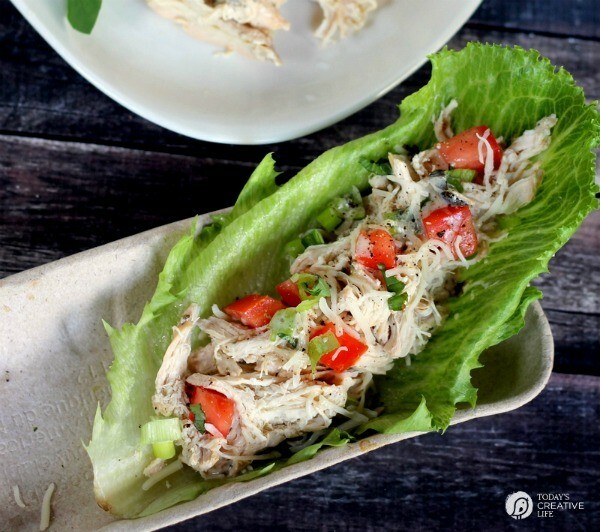 Taking the lettuce cups/wraps, add about ¼ cup chicken to each one and then top with tomatoes, green onions, parmesan cheese, and freshly cracked black pepper. Spoon additional sauce over lettuce wraps if desired. This is a really fun recipe to set up like a taco bar - leave everything in it’s own bowl and let people assemble their own wraps!